This is one of those, “Which came first, the chicken or the egg” conversations. 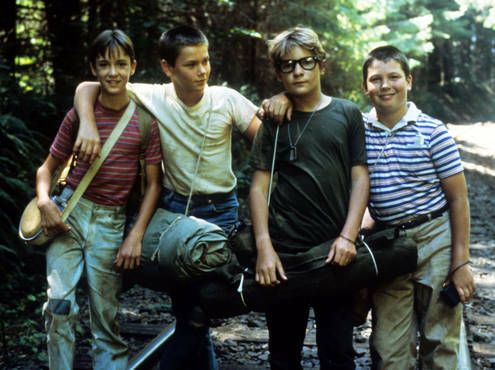 In 1986 the movie “Stand by Me” came out, and for many people the song came out after the movie. In reality, as I soon discovered, the song pre-dated the movie by close to 25 years. Originally released in 1961 it peaked on the charts at number four. So the movie actually breathed life into the song, giving it a second chance on the Billboard Hot 100, rocketing it all the way to number nine. Ben E. King died a couple months ago, and “Stand by Me” featured prominently in all the eulogies. At first it was kind of strange. “Stand by Me” was on the radio, and I’d heard it before, occasionally, like other songs from the 1960s. Then it played more and more frequently. Back in 1986, movie publicity consisted largely of commercials on TV and occasionally on radio, ads in magazines and newspapers, previews on shows such as “Entertainment Tonight” and a newsmagazine on CBC called “The Journal”, and trailers in the theatre. It was on “The Journal” that I first heard about a movie called “Stand by Me” that used the 1960s ballad as a theme song. It was a film about four boys going to see a dead body, based on the novella “The Body” by Stephen King. Initially, I was not interested because, back then, Stephen King was synonymous with horror and I was not really a big fan of horror books or movies, although my sister and my friend Dave both loved Stephen King. However, “Stand by Me” was not a horror movie. In fact, it was directed by Rob Reiner who, once he escaped the typecasting of his “Meathead” character from the comedy “All in the Family”, would go on to a successful career as a director. Instead, “Stand by Me” was about four boys coming of age. They faced the problems we all do at that age – bullying, puberty, insecurity, and so much more. Wil Wheaton; River Phoenix; Corey Feldman; and Jerry O'Connell. The four boys were played by a variety of actors, some who were already known, others who would go on to solid careers, and some who would meet tragedy. Wil Wheaton would go on to fame, and some derision, as Wesley Crusher in “Star Trek: The Next Generation”. In fact, that show debuted just a year or so after the “Stand by Me”. He still capitalizes on that role in his frequent appearances on “The Big Bang Theory”. River Phoenix had already been in movies such as “Explorers”, and would go on to roles in “The Mosquito Coast”; “A Night in the Life of Jimmy Reardon”; “Running on Empty”, where he earned an Oscar nomination; “Indiana Jones and the Last Crusade”, where he played the young Dr. Jones; “My Own Private Idaho”, where he received critical praise and awards; and “Sneakers”. Sadly, he died outside a nightclub in 1993 at the age of 23. Jerry O’Connell, who played the chubby kid in “Stand by Me”, would go on to turn the tables, playing the hot shot quarterback in “Jerry Maguire”. However, he was best known for recurring roles in the television series “Sliders”; “Crossing Jordan” and “The Defenders”. Corey Feldman was by far the best known at the time, starring in several movies, such as “Gremlins” and “The Goonies” then later “The Lost Boys”; “License to Drive”; and “The ‘Bubs”; and TV shows such as “The Bad News Bears”. I never did see the show in the theatre, as it was still pretty hard to get to the city back in 1986. However, I did see the movie on tape maybe six months after it came out. Back then, convenience stores often had kiosks where you could rent movies. I was working at a greenhouse in the spring with my best friend Chris Vining. It was a Saturday night, and we decided to rent a movie after work (Friday nights after work were always reserved for cruising the strip in Lethbridge). So on the way back to the farm, we stopped at the Red Rooster in Coaldale and rented “Stand by Me”, and watched it in the comfort of our living room. The music video for “Stand by Me” featured clips from the movie to accompany Ben E. King standing there and singing. It was the perfect representation of the song and the movie of the same name. “Stand by Me” signaled so many things. It was a great vehicle for its four young stars to showcase their talent. It was the first of what would become a series of movies based on Stephen King works that were not horror. “The Shawshank Redemption” and “The Green Mile” would follow in the footsteps of “Stand by Me”. “Stand by Me” was also the springboard for Rob Reiner’s career as a director. He had already made “This is Spinal Tap”; and “The Sure Thing”; but “Stand by Me” earned him his first Directors Guild of America award nomination. He would go on to direct “The Princess Bride”; then “When Harry Met Sally…”, where he was nominated for another DGA award; “Misery”; “A Few Good Men”, for which he received a third DGA nomination; and “The American President”, where he was nominated for a Golden Globe. The list goes on and on as he continues to direct. For me, it was another teen angst, coming of age movie that inspired me to write my own stuff. I could relate to it because I was only 16 and going through many of the same things as those characters. I hoped I could create the same feeling when people read my stuff, that I felt seeing "Stand by Me". And, this movie about four best friends, was a cool way to spend a Saturday night with my own best friend.